Coming soon! We are working on the feature story about our retreat which we will be posting here! Please check back soon! In Northern California tribes, basketry was a learned skill used to make baskets for every day life. Baskets were used for eating, gathering, sorting and cooking. They were also used as part of ceremonies and to carry children. In today’s society, basket making has become an art form. Many tribes and tribal peoples, however, still make and use baskets in their daily lives and in ceremony. These skills are passed down not only as art but as necessities to continuing a tribal way of life and as a way of tying people to their culture so that they can better utilize the healthy, healing aspects of tradition. Among the Hupa, Yurok, and Karuk people, traditional weaving practices are remarkably similar. These similarities are due in large part to the close proximity that these cultures have to one another as well their interest in sharing aspects of their material cultures with their neighbors. Additionally, intermarriage between tribal members from these groups was somewhat common and facilitated the spread of a popular aesthetic and method in regards to basketry. Since they shared the same landscape, the Hupa, Yurok, and Karuk use many of the same plant materials in their traditional basket weaving. The most commonly used plant materials for traditional basketry in northwestern California were Hazel (Corylus californica), Willow (Salix sp. ), Conifer Root – especially Gray Pine (Pinus sabiniana), Bear Grass (Xerophyllum tenax), Woodwardia Fern (Woodwardia Fimbriata), Alder bark (Alnus sp. ), and Maidenhair Fern (Adiantum). Occasionally, a skilled weaver making an especially decorative basket for ceremonial purposes might attach woodpecker feathers, dentalium shells, and even weave in dyed porcupine quills to enhance the beauty of their design. Basket weavers from this region of California commonly used a single sided overlay method, with their designs only appearing on one side (usually the outside) of the basket. Hupa, Yurok, and Karuk weavers employed several different basketry techniques to ensure that their baskets were both functional and beautiful including plain twining, three strand twining, and lattice twining. A hallmark of Northwestern California basketry is the near perfectly trimmed rims and the precision of the designs. Aiy-yu-kwee'. My name is Kateri Masten and I am a member of the Yurok Tribe. Growing up I always had an admiration for my culture as well as a thirst for learning our traditional art of basket weaving. At the age of 6 I picked up my first lesson on weaving under my mentor/great aunt, Josephine Peters. It wasn't until the age of 18 when I became more dedicated to mastering this beautiful, unique, and challenging gift. Now, after a decade of weaving I think I finally have it down! In those ten years I have woven baby rattles, baby baskets, burden baskets, and as well as some creative pieces. Aside from weaving I recently have had the honor of teaching a women's weaving circle for the Trinidad Rancheria. I've also assisted in demonstrations/tutorials with the local youth through summer camps. I'm also a member of the Native Women's Collective which is a non-profit organization devoted to helping native artists with their art. It is my honor and privilege that this practice of tradition has given me the necessary skills to be able to pass onto others. Basketry is a gift given to us by spirituals, and the knowledge was meant to be shared to continue our traditions. Weaving takes me to a place so indescribable, and nothing pleases me more then to be able to pass on this part of our culture to all generations. You can learn more about Kateri and her work by clicking here. Titles below that include a photo offer a summary and review written by one of our NWC contributors. 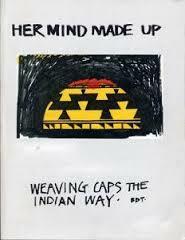 Learn more about the book and basket weaving by clicking on the title or photo! Bibby, Brian. 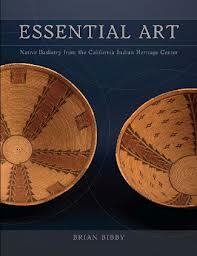 Essential Art: Native Basketry from the California Indian Heritage Center. Heyday Books, 2012. Bibby, Brian. 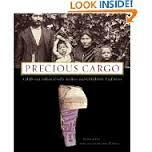 Precious Cargo: California Indian cradle baskets and childbirth traditions. Heyday Books, 2004. Bibby, Brian. The Fine Art of California Indian Basketry. Heyday Books, 1996. Chancey, Jill R. By Native Hands: Woven Treasures from the Lauren Rogers Museum Art. Lauren Rogers Museum of Art, 2005. Cohodas, Marvin. Basket Weavers for the California Curio Trade: Elizabeth and Louise Hickox. [Tucson]: University of Arizona Press;[Los Angeles, Calif.]: Southwest Museum, 1997. Eisenhart, Linda L. "Hupa, Karok, and Yurok Basketry." The Art of Native American Basketry: A Living Legacy 5 (1990): 241. Farmer, Justin F. Basketry Plants used by Western American Indians. The Justin Farmer Foundation, 2010. Farmer, Justin F. Creating An Indian Style Coiled Basket. The Justin Farmer Foundation, 2012. Fields, Virginia M., and Clarke Memorial Museum. 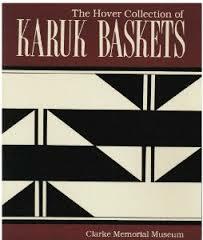 The Hover Collection of Karuk Baskets. Clarke Memorial Museum, 1985. Gogol, John M. American Indian Basketry.Vol.III, No.1. 1983. Israel, Claudia. Baskets and Weavers. Clarke Memorial Museum, 1996. James, George Wharton. Indian Basketry. Dover Publications, INC. NY, 1972. Kallenbach, Elizabeth A. 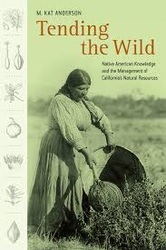 "The California Indian Basketweavers Association: Advocates for the Use of Museum Collections by Contemporary Weavers." Museum Anthropology Review 3.1 (2009): 1-13. Kroeber, Alfred Louis. Basket designs of the Indians of northwestern California. Vol. 2. No. 4. The University Press, 1905. Mason, Otis Tufton. Aboriginal American Indian Basketry. Peregrine Smith, Inc, 1976. (re-print of 1904). Moser, Christopher L. American Indian Basketry of Northern California. Riverside Museum Press, 1989. Reese Bullen Gallery. Elizabeth Conrad Hickox (1873-1947) Baskets From The Center of the world. Humboldt State University, Reese Bullen Gallery, 1991. Shanks, Ralph C., and Lisa Woo Shanks. Indian baskets of central California: art, culture, and history: Native American basketry from San Francisco Bay and Monterey Bay north to Mendocino and east to the Sierra Nevada. Vol. 1. Costaño Books, 2006. Shanks, Ralph C., and Lisa Woo Shanks. 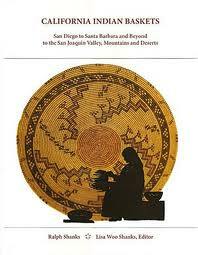 California Indian Baskets: San Diego to Santa Barbara and Beyond to the San Joaquin Valley, Mountains and Deserts. Vol. II. Costaño Books, 2010. Turnbaugh, William A. and Sarah Peabody Turnbaugh. Basket Tales of the Grandmothers. Thornbrook Publishing, 1999. Washburn, Dorothy K. "Dealers and Collectors of Indian Baskets at the Turn of the Century in California: Their Effect on the Ethnographic Sample." Empirical Studies of the Arts 2.1 (1984): 51-74. Yamane, Linda. Weaving a California Tradition: A Native American Basketmaker. Lerner Publications, 1997.